Our line of 6-color, heavy-duty, institutional-quality beach balls are great for the pool, volleyball, toss games and add fun to just about any physical activity. Because these balls are about 25% thicker than most beach balls, they'll stand up to daily institutional use. Balls are made from phthalate-free vinyl. NOTE: Ball dimensions listed are the diameters of the balls as measured across the width of a deflated ball. The inflated diameter of a ball will be about 65% of the deflated size that is listed. For example, a 24” “deflated” ball, will have an inflated diameter of about 16”. 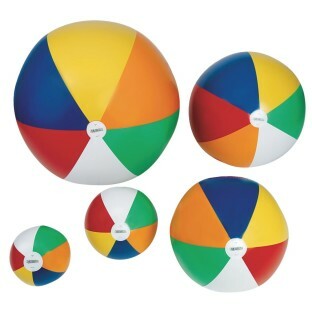 This flat diameter is the industry standard for how beach balls are described and measured. All ages enjoy the various size beach balls. Good for mini hand volleyball to noodle hockey games. Just what we have been looking for. 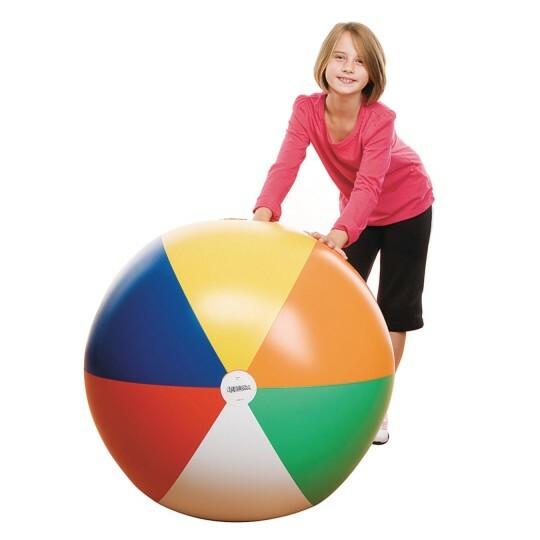 We have a group of seniors that play water volleyball and have been using a 24 beach ball in a brand that we can no longer find. Most beach balls are too light and difficult to control. This one is thicker than most beach balls although not quite as thick as the brand we have been using. It also has a matte finish and isn't as slippery as the shiny lightweight beach balls we've tried. I ordered six of these but have not checked that they all hold pressure. The test will be how long they hold up to use over the next few months. We used these for beach volleyball in middle school and they loved it! We use this in a Memory Care Unit. The residents love playing with the volleyball!! Keeps them laughing and active!